The dark orange cover caught my attention at the bookshop. I've no idea who Koji Morimoto is but his manga style is the kind I like. This is a paperback with dust jacket, originally published in 2004 and reprinted in 2009. The pages are thick and the book is large with 250 pages. Koji Morimoto has worked for various television series and feature films, most notably he was the animation supervisor on AKIRA. He also wrote and directed the short Beyond from The Animatrix series. He's also one of the founders for the Japanese animation studio Studio 4°C. 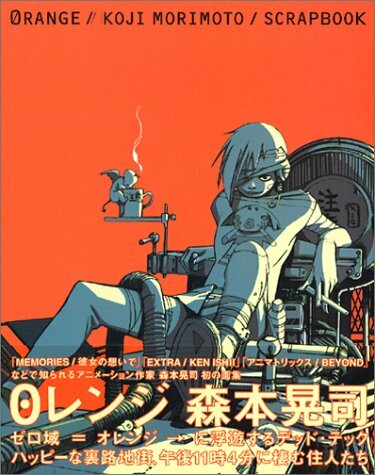 0レンジ(オレンジ)~森本晃司作品集~ (Orange / Koji Morimoto / Scrapbook) is a collection of sketches mainly on character designs and strange urban settings. There are black and white line art, coloured illustrations and some photos. I'm don't know if any of these concepts are used in animation for I can't recognise any except for Saya from Blood: The Last Vampire (which is probably fan art). There are plenty of great characters to look at, the different designs and costumes. The sketches are actually quite refined. Characters are well formed, silhouette is strong and distinct, as expected from an animator of such caliber. Right at the end is an interview between Katsuhiro Otomo and Koji Morimoto. This book is in Japanese but has English translated text. Overall, it's a great Japanese art book for manga enthusiast, not just Koji Morimoto fans. short little films by studio 4c. amazing stuff! he also directs a few. the to buy list just keeps growing! I already own this book. It's awesome. There is so much manga out there, but little that is this strange and in this style. I highly recommend this to anyone who is interest in Manga. Studio 4c is one of the greatest animation companies in the world. One of my favourite pictures in the book is of the tiny Japanese bar that is covered in his work. It looks like it could only fit about four people in there. Got this book too, completely amazing! can't recommend it enough. I might have watched a few anime from the studio without knowing so. The one I know was the short Magnetic Rose from Memories, lent to me after my friend read this review.